The leaves have changed, snow has arrived in much of the country, and Thanksgiving is only days away! Before we leave to spend a day celebrating all that we are thankful for with our families, we’re sharing an activity that shows that the Thanksgiving holiday can be about more than gorging ourselves on the best food the year has to offer. So without further ado, let’s put those hand turkeys to mathematical use! First, a little background information. 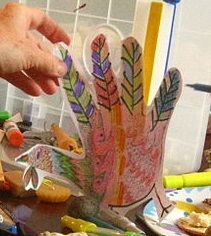 This Hand Turkey Geometry activity is based on the Hand Geometry activity we use in our SMU CSI curriculum. Hand Geometry is a biometric tool that is used to identify people in a variety of places. However, hand geometry is not completely unique to each individual and is not typically used for highly secure information. Follow these procedures to make and analyze your hand turkey. The materials needed for this activity are pretty basic, but if you’re feeling particularly crafty you can take some time to decorate your hand turkey too. Let’s bring the arts out to play with STEM! Measure (in centimeters) the length and width of each of your fingers and write these down (you can click on the table below to get an easy-to-print version or you can just make your own table to organize your information). Record the length as a fraction in the first length column and then convert the fraction to decimal and record the number in the second column. For example, if index finger from point A to B is 3 ½ cm, the length is 3.5 cm in decimal form. Repeat the same process for the other four fingers and record the measurements in the table. Measure your palm length and width. The length of your palm should be measured from point C to point L and the width of your palm should be measured from point I to point K in the picture shown. Multiply the length and width of each of your fingers and your palm to find their areas. Write these answers in the table. Add all of these results to find the total area of your palm. So, what did you find? Are there similarities in your hand turkey areas? Now that you’ve used your thanksgiving hand turkey to learn about your hand geometry, put these numbers to further use to find your Biometrics Alias! Whether it’s Frankie “Danger” Blitz or Bonnie “Black Widow” Mayfair, your biometrics alias is sure to keep you incognito! We wish all of you a very Happy Thanksgiving!